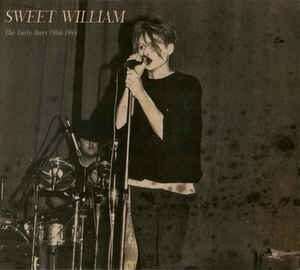 SWEET WILLIAM exist since 1986. The band is founded by Oliver Heuer. In 1989 SW record their first album "These Monologues". In 1990 it is first released on Vinyl on Big Noise Rec. Because of the good sales other record companies are interested in SW. In 1991 SW sign a contract with Hyperium/Rough Trade. The albums "These Monologues" (CD rerelease), "Kind Of Strangest Dream" and "DevelopmentThrough The Years" are released in that period. In that time SW play several tours through Europe. In 1994 their tour ends at the Marquee Club in London. In 1998 SW release the album "Show" on Dion Fortune Rec. The album reaches postion 14 in the German Alternative Charts and stays there for 4 weeks. After some years marked by line up changes the band finds a new drummer in 2001 and starts to record several albums and EP`s which are released on their own label. In 2010 SW release the album “Brighter Than The Sun” on the French label d-monic. Good press reviews and world wide good sales follow. In 2012 the French label Infrastition rereleases the album “Kind Of Strangest Dream 2012” as a 20th year anniversary cd, limited 444 copies. In may 2013 the new release “Ocean” a concept album with 74 minutes of music will be out on d-monic. In 2015 d-monic rec. releases the album "Live on the French Riviera 1995" - a live cd recorded in Valbonne, 2015. In 2015 SW were asked to play an acoustic concert in Paris. The reactions are overwhelming. SW start to work on new acoustic songs. The band plays some more acoustic shows at the end of 2015. 2016 will be the year of the 30th anniversary of SW. Therefore some special releases are planned. First release is the book "1986 - 2016". The next three releases are the acoustic album "Organic Shades", the album "Rarities 5" and the CD Box "Rarities 1986 - 2016". Besides that the final recordings and mixdowns for the new album "TIME" are made. In November 2016 "TIME" is released on d-monic/datakill records. In 2017 SW start to record some of the tracks from the very beginning of the band. Tracks from 1986 - 1988 that were never recorded before in a studio. The result is released on the album "THE EARLY DAYS 1986 - 1988". The album is released on d-monic/datakill records 31.01.2018. Background/Info: German formation Sweet William saw the daylight in 1986. Set up by Oliver Heuer and joined by Marius Nagel and Bodo Rosner the band started composing their first songs. While their now can look back at a serious discography, this work brings us back to the first hours of the band. Eleven songs have been selected and recorded for the very first time in studio quality. I’m always a bit skeptical when a band moves back to the early days of their history, but I’ve to say that this album is a fascinating and fully entertaining piece of music. The rock-wave mix sounds great and passionate. It has been a real good idea to release this album. I don’t know how the original versions sounded, but this album has a typical 80s flavor carried with a real good production. No doubt Sweet William did a great job to improve the original sound quality of the songs. The artwork of this digipak also features several pictures from the band’s early days. I’m not always a huge fan of bands releasing their ‘old’ and forgotten stuff, but I’ve to admit that there’re always a few exceptions to the rule and this album makes sense. Je hoeft geen groene vingers te hebben om het ‘Duizendschoon’ te zien bloeien. Het Duizendschoon als vrije vertaling voor Dianthus barbatus. Of zoals d’Engelsen zeggen Sweet William. Het mag dan ook niet onterecht zijn dat de Duitse gothic-indie-wave-postpunk-en nog veel meer kastes-band Sweet William er zijn groepsnaam aan ontleende. Schoon wegens niet te vatten in één en dezelfde lading en Duizend wegens een inmiddels sterk uitgebreid release-palmares. Het plaatje klopt. Sweet William is inmiddels aan zijn 32ste levensjaar begonnen. Omdat alles een begin heeft en dat wel eens durft vergeten te worden hebben die van Sweet William nu zelf gezorgd voor hun persoonlijke oerknal. De band an sich werd opgericht ten tijde 1986 en met de veelzeggende compilatie The Early Days 1986 – 1988 bieden ze de staalkaart van eigen historie. Een historie die aan de startlijn eerder gebukt ging onder improviseren met de onderliggende gedachte van ‘we zien wel waar we uitkomen’. De enige echte muzikant destijds was hun drummer Marius Nagel, de overigen met name Oliver Heuer als vocalist vergezeld van een haast snaarloze gitaar en Bodo Rosner op bas leerden hun instrumenten gaandeweg van naderbij ontdekken. The Early Days bieden dan wel een overzicht van het prille begin van Sweet William, al werden de tracks recent nog opgenomen en is de progressie duidelijk herkenbaar wegens het in dezer dagen wel kunnen beheersen der instrumentarium. Niet om ons op een dwaalspoor te brengen, maar wel omdat ze geen degelijke geluidsopnamen hebben van toentertijd. Tijden ook waarin ze doelbewust (?) kozen voor een richting die aanleunt bij een eigengereid geluid van een mooie mengeling tussen indie en postpunk. Waarbij vooral de treurnis en meezingbaarheid van Just A Thought, Another Place en All The Same durven op te vallen. De kleurloosheid van het leven concentreert zich rond An Impression Of Life en verschuilt zich onder hetzelfde vreemdsoortig geluid dat in nog eerdere jaren ook eigen was aan pakweg The Stooges. Vooruitziendheid was er ook reeds met Development Through The Years, toen al wetende dat het begin nog maar het begin was. Een track als 4 Days ademt dan weer een zelfde soort atmosfeer uit die we ook reeds hoorden bij een Sisters Of Mercy, zij het in de melodielijn. Muzikaal dan wel voorzien van een heerlijk samenspel der echte instrumenten. Invloeden uit alle windrichtingen zijn er zeker wel, al weten ze die met veel eerlijkheid naar eigen hand te zetten. Coloured Feelings doet zo wat Chameleons aan, terwijl Nailed To The Ground de fundamenten van een Bauhaus handig weet te verpakken. De enige track in moeders taal, en met net anderhalve minuut op de teller, is voor het krachtdadige Gelb Und Grün. Sky doet het eerder mysterieus en ingetogen. De terugblik naar de dagen van weleer wordt eerbiedig en bijzonder afgesloten met Only Way Out. Tijd is relatief zei ooit een slim mens, nostalgie kan meer zijn dan enkel het sentiment van weleer. 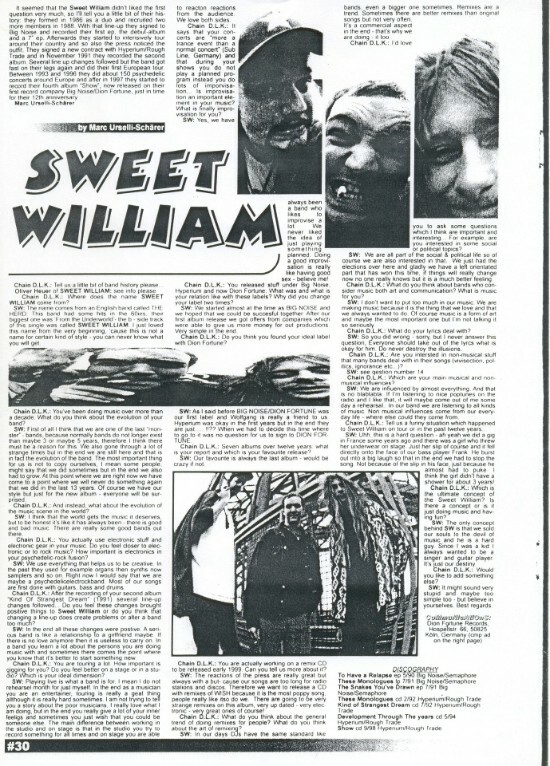 Met The Early Days 1986 – 1988 blikt Sweet William terug naar de onwetendheid der beginjaren. Vrij recent opgenomen zonder daarbij de feeling van de jaren 80 te verloochenen. De start waarvan de finish nog lang niet in zicht is. Sweet William are back with something new that's old, or something old that's new. These are songs from the band's earliest days (1986-1988) when they were more post punk than goth, and certainly sound like it too. Unfortunately there were no good studio recordings of the band's songs from this time so they did the next best thing- went into the studio (2016-17) and recorded them. No jazzed-up, modernized production here- Sweet William wanted to make these tracks sound like their late '80s album that never was, and to their credit, they succeeded. Maybe the band is more polished now than they were back then, after all, being together for so long will do that. Still, the songs speak for themselves, short (for the most part) simple and to the point. There are shades of Joy Division, Wire, The Birthday Party, The Chameleons, Killing Joke, Red Lorry Yellow Lorry, and perhaps most notably- Bauhaus. Although I'm sure Oliver Heuer and the band had other influences (such as Dylan on "An Impression of Life," and the Stooges elsewhere) but vocally if you took equal parts of Nick Cave, Peter Murphy and Ian Curtis, with a slight dash of post-Japan David Sylvian it might sound something like this. The eleven songs on this album are as good as anything those aforementioned bands were producing in their early days, perhaps with the exception of their most iconic song(s), but it took a decade of hard work and evolution for Sweet William to achieve a decent measure of success. While this album is more or less a time capsule, I believe it stands on its own as a remarkable achievement. If it was released in 1988 and I had heard it at the time, I definitely would have bought it, and likely played it a lot. There is plenty of atmosphere and attitude here, and you can tell where this band would eventually be heading. Interestingly, there is only one song sung in German ("Gelb Und Grun") and that's pretty short. Fine by me though, as it adds a bit of 'tude. It was certainly a worthwhile endeavor for Sweet William to reproduce these songs without bastardizing them as some groups might have been tempted to do. Recommended! Mit rund einem Jahr Verspätung zelebrieren Sweet William mit „Time“ ihren 30. Geburtstag. Das stimmt so nicht ganz: Nachdem die Scheibe 2016 pünktlich erste Gehversuche auf den Weltmärkten unternahm, erfolgt erst dieser Tage eine fokussierte Form der Promotion. Aber wie dem auch immer sei: Älteres und frisches Material fügt sich, wie könnte es bei dieser solitären Band auch anders sein, zu einem stets etwas enigmatisch aufbereiteten Konglomerat aus dezenter Neo-Psychedelia und Wave Rock, wie dies sonst kaum wer hinbekommt. Um Nuancen unterkühlter gefasst, als von unvergessenen Edelalben wie „Kind Of Strangest Dream“ gewohnt, ziehen Oliver Heuer und Co. offenbar unbeirrt ihre Kreise, die sowohl den Mainstream als auch den Underground tangieren. Eine beharrlich spürbare Aura des Unvorhersehbaren macht aus „Time“ ein in sich nebulös schlüssiges Werk, das sich das Prädikat „spannend“ redlich verdient. Und mit ein wenig Geduld schälen sich dann auch veritable Gemütserwärmer heraus. So wie zum Beispiel das erratisch fesselnde „Kind“ oder das zehrend lakonische „Out Of This Blue“. Tipp am Rande: Die Coverversion von „A Means To An End“ (Joy Division) sollte man sich (auch als Gratis-Download) nicht entgehen lassen. 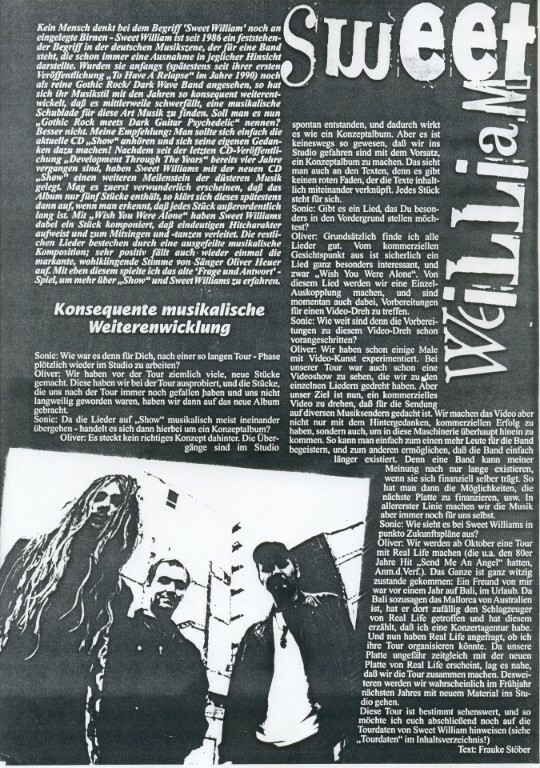 Background/Info: German formation Sweet William released this album for their 30th anniversary. The band was set up in 1986 by Oliver Heuer and has released an impressive number of productions. “Time” was released at the end of 2016, but we only got the album a few weeks ago. It’s a collection of previously unreleased songs plus new tracks composed in between 2014 and 2016. Content: “Time” is an eclectic work, which features the familiar goth-rock sound of Sweet William, but also opens a door to some experiments with psychedelic passages and other influences. The guitar playing is quite impressive on the darkest, gothic songs, and it also excels in the psychedelic. I sometimes get the impression of hearing an imaginary jam session between Joy Division and The Doors. + + + : “Time” is one of the most diversified releases by Sweet William I’ve heard. From pure and well-crafted dark guitar-gothic songs to psychedelic guitar play to more heavenly parts reminding me of The Cure to more evasive songs, this album has a lot to offer. Sweet William feels comfortable dealing with all different kind of influences, but the main strength is the guitar play. From typical dark and anguishing new-wave to psychedelic to fuzzy parts, Oliver Heuer is a talented musician. This is a mature production accomplished with delicate treatments like piano arrangements and electronic treatments. I also have to mention the great vocals’ production, which here again features a great diversity. I don’t see real minus points to mention. From a very personal point of view I’m less excited by the softer and into melancholia sounding tracks. 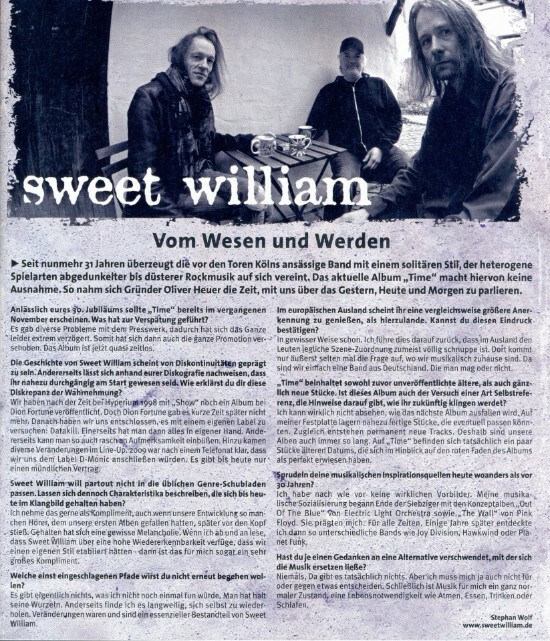 Conclusion: I’m still convinced Sweet William is one of those bands that should have deserved more (international) recognition during their entire career. “Time” is a great goth-rock production featuring multiple cool songs. Best songs: “Room”, “Say Good Bye”, “Out Of Here”’, “Slow Down”, “Slow”, “Funny”. Now here's a band I haven't heard anything from in a really, really long time. Not their fault though. This German band was founded in 1986 by singer/guitarist Oliver Heuer, and has had dozens of releases since that time. I know I've heard them here or there before, but I can't remember when or where. I don't have time to walk their back catalog to catch up (more new releases keep pouring in every day) so I'll be primarily concerned with this one. From what I remember Sweet William was ensconced in the Goth-Punk-New Wave hybrid genre, and Heuer's vocals were a bit Nick Cave-like, while the music was reminiscent of The Cure and New Order. I also recall them being kind of raw too. Over time I think the band's sound was refined, and polished, and 'Time' reflects that. The band covers a lot of ground over 15 tracks on this album, and while not every one is a winner, there is still plenty to enjoy. The album starts out kind of weakly with the low-key "A Face Without a Name," but picks up steam as it goes along. "Funny" is a throwback to simpler times but has mood and groove. For some reason "Kind" reminds me of David Sylvian, perhaps more in the emotion department than anything else. Electro-techno elements burnish "Say Good Bye" and now we're cookin' with gas. "No Need To" has plenty of Goth atmosphere with its spooky theremin-like synth and understated, nearly moaned vocals. It also reminds me a bit of latter-day And Also The Trees. Nice guitar work too. "out of Here" is the first track with some real punch. This is the kind of stuff you'd expect from a good Goth band with 30 years of experience under its collective belt. They tone it down a notch with "Slowdown," a track with oodles of drenched in reverb psych atmosphere and seething darkness. "Room" is the epitome of '90s Goth, yet with a sort of twist. It will remind you of what you liked about Goth bands in the first place. "Yesterdays" is another strong song with a simple but memorable guitar riff and a nice chugging groove. Bet it goes over good live. "out of This Blue" has a very Nick Cave vibe to it. "Magic of The World" is an interesting number that instrumentally builds with layered sequenced synths a good 2.5 minutes before any vocals come in, and when they do, they're synth-processed. The lyrics are mainly the song title, and perhaps that's all that's needed here. The ironically titled "Slow" really isn't slow at all and has this great moving bass riff with vocals that ooze over the top like molten frosting on a burning cake. "My Ignorance" should have been a better song with a good beat and great guitar work but just falls short of being memorable lacking a potent hook. That's redeemed though with "Confusion Taking Over" a mind-bending gothy psych-out that's bound to leave an impression. It all ends on a "Summer Night," a song with a provocative groove, some nice unexpected changes to keep it interesting and a moody atmosphere. Overall on 'Time' Sweet William exhibits a good degree of sophistication with effective arrangements, excellent use of keyboards and electronics and varied songs. Worthy as it's bound to grow on you and stay on the playlist for quite some time. 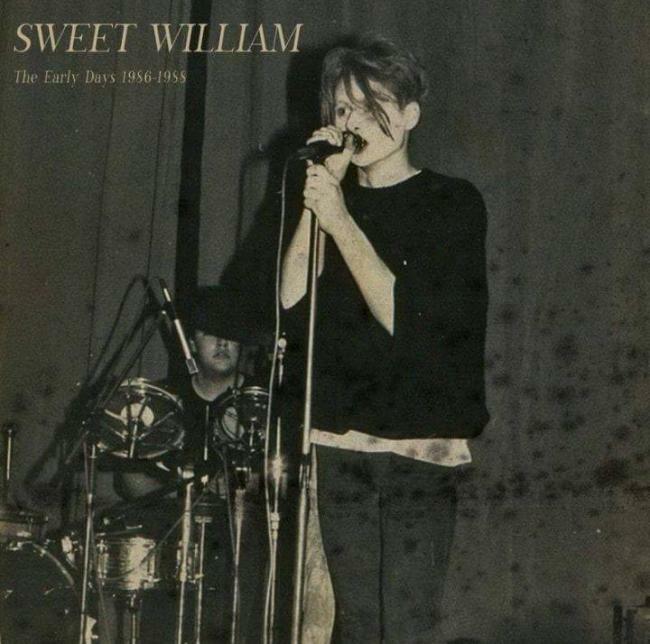 Background/Info: Sweet William has already been active since the 80s and can look back at a serious discography. Some early productions were released on Hyperium Records while they later on self-released a lot of work and they joined hands together with D-Monic as well. The German formation driven by the creative spirit of Oliver Heuer is now back on track unleashing a new opus featuring 4 cover versions, 4 songs taken from previous albums and one new cut. The main characteristic of the record is the ‘acoustic’ format of the songs. Content: Whitesnake, Joy Division, NIN and Electric Light Orchestra inspired Sweet William to compose cover versions. They transpose the original music into a very own adaptation characterized by gothic, rock and even folk-wave influences. It sounds dark and dreamy. The previously released songs (taken from the albums “Ocean” and “Time” are quite comparable in sound and influences while the final (new) song is an instrumental outro. I was seriously impressed by the cover versions and especially the beautiful and sensitive interpretation of “New Dawn Fades” (Joy division). It’s a dark and dreamy ballad with an elevating chorus. The songs sound as it was originally written by Sweet William. Another great cover is Whitesnake’s “Here I Go Again”, which sounds like the perfect folk-rock symbiosis. I fully enjoyed the delicacy of this work carried by beautiful vocals. Conclusion: “Organic Shades” reveals a sensitive side of Sweet William, which has been transposed into cover versions. The cover songs have been reworked and adapted like very own songs and the result is worthy of examination. Best songs: “New Dawn Fades”, “Here I Go Again”, “Hurt”. Good news : Sweet William is back with a new album. Oliver Heuer and his band present “Ocean”, a concept album that will take you from quiet to dark waters, and back. The ocean is here a symbol for life and human condition, so the German present a vast panel of emotions as well as musical genres. 27 years have passed since the band has formed, and listening to this album you will feel maturity and sobriety, but also a wish to perpetually experiment and reassess. The line-up is a return to the band’s roots, with Marius Nagel (drums), Frank Breuer (bass and programming, and Markus Gerlach (drums, percussions). Oliver Heuer is in charge of vocals, guitars, synths and programming. As seagulls welcome you together with soft keys in the neoclassical intro of the album, you might think you’re about to listen to some new age album, but Sweet William has prepared a fine album of gothic rock with a modern electronic twist to it. 18 tracks – it is a long album- of variations of moods and styles, like an emotional rollercoaster, like the ocean, like life. The concept is clear, and the album sticks to it entirely. You´ll hear some gothic rock songs, close to perfection. “Reach out” , the amazing “Ocean” and “Over” have great riffs, fantastic vocals, head banging drums, and they will remind you how inspired and talented this band is. The special sound of Sweet William, electro-acoustic guitar alternating with electric guitar close to hard rock, is back and it’s great to hear these new songs. To explore the human mind’s darkness and complexity, some tracks are more experimental and psychedelic. This is the case of “Insane” and “Tsunami”, the best tracks on the album in my opinion. “Insane” is oppressive, claustrophobic, and the distortion of vocals transmits the feeling of insanity while guitars and synths grow more and more threatening. It reminds me of another amazing track of Sweet William: “18.01.1991”.“Tsunami” follows the same path, and goes even further in the experimentation and darkness. It is instrumental only, with tortured guitars and computer produced sounds. Remarkable. “Turning” is another very good rock song, more up-beat . Guitar parts are amazing and the synths give the song a new wave feel. Also included is a cover of Joy Division’s “New Dawn Fades”. The band has made a sober and faithful cover, yet they have added heavier guitars and more depth to the song, giving it their particular sound and making it fit perfectly in the album. “Until you sleep” is a piano ballad, a good song in itself, but quite surprising on a Sweet William album. The band has decided to experiment with electro/dark ambient sounds on this album, and many tracks follow this path. Some tracks blend these sounds perfectly with Oliver Heuer’s strong vocals and rock guitars, for example “Everytime and Everywhere”. “Welcome to the Show” is a very danceable track, and very original. With “Silence”, Depeche Mode comes to mind. It is a relaxed peaceful track, with synths like waves of a quiet sea. “Last Restart” is a very cool Dark Wave track, danceable and dark. The album ends with two interesting songs: First “A walk down to the sea”, an experimental ballad that will hypnotize you, then “The End of the World”, perfect conclusion to the concept album, seem to represent the calm after –and before- the storm. 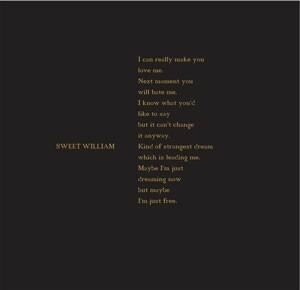 With this new album, Sweet William proves that they still have much to say. They also prove that they are not ready to rest on their laurels, and that is something that deserves respect and admiration. Oliver Heuer’s vocals are still spellbinding, not to speak about the guitars. Some tracks on the album are simply amazing. However, this is not a classic gothic rock album, so in order to enjoy the most of it, keep an open mind to it. Content: We got this promo copy of the latest Sweet William-album with some delay, but I couldn’t resist sharing my enthusiasm with you. Sweet William can be considered as veterans active on the gothic scene, but at the other side they’re not exactly the most prolific band. Sweet William rather releases albums on irregular basis, which each time again gives me the sensation to rediscover this formation. “Ocean” brings us back to the glorious and still that inspiring days of the 80s. I can easily speak about influences merging between The Sisters Of Mercy and The Mission. But I also have to mention Joy Division, which Sweet William has tried to bring an ode covering the legendary “New Dawn Fades”. Let’s start with this cover, which is a rather exiting version revealing the dark and 100% new-wave inspiration. Other songs remind me of real good souvenirs from bands like The Cult and even The Stooges. A song like “Insane” has this raw and dark touch reminding me of The Stooges. There’s a good balance in the mix of guitar, bass, drums and electronics. That’s what makes the sound of this new work featuring 18 songs. The diversity between the tracks is another and main element of the album. I can’t imagine an album with 18 songs in a similar vein. Sweet William has this delicacy to inject surprising cuts like the outstanding piano-ballad like “Until You Sleep”. I also like the lyrical content of this track. The song creates a delicious contrast with the more evasive, and Sisters Of Mercy reminding, “Turning” coming next. And there’s even more diversity. So I have to mention the instrumental “Tsunami”, which appears to be a kind of intermezzo. “Ground” again sounds pretty different and seems to get inspired by triphop elements. But next to this cool diversity there also is a very homogeneous aspect, which is mainly carried by the evasive format of the songs. You definitely can hear all the maturity of Sweet William that comes through in a professional production resulting in well-crafted and efficient songs. I like the delicacy of the writing carried by great choruses. Conclusion: Like an ‘ocean’ this album sounds like an invitation to get driven by dark waves to explore imaginary unknown places. This is a fully accomplished piece of work featuring a few little pearls. Best songs: “Until You Sleep”, “Ocean”, “New Dawn Fades”, “Turning”, “Reach Out”, “A Walk Down To The Sea”. Los legendarios artistas del sello Hyperium vuelven con un nuevo disco conceptual bajo el brazo que es una pura delicia: Se abre con un prólogo instrumental que deja paso al tema que da título al disco, "Ocean", recuperando el SONIDO CLÁSICO por el que son conocidos y volviendo sin duda a sus raíces. “Ocean” retrata los abismos humanos, la debilidad, soledad y permanencia, narrando además temas de belleza, esperanza, sueños y confianza en la vida. Baterías potentes, pasajes electrónicos que crean atmósferas tenebrosas, guitarras firmes y voz sugerente rezumando todo ello puro GOTHIC ROCK. Incluye una maravillosa versión de Joy Divison (‘New Dawn fades’). 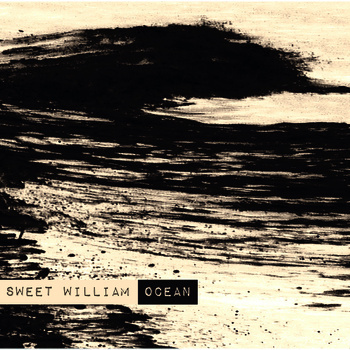 Het nieuwe album, “Ocean”, toont aan dat het menens is voor Sweet William en dat het comeback album “Brighter Than The Sun” (2010) niet zomaar een onschuldig tussendoortje was, een stuiptrekking van vergane glorie. Nu is er “Ocean” een conceptueel album waarbij de oceaan wordt aangevoerd als metafoor voor het leven en de existentiële vraagstelling die met intelligent leven gepaard gaat. Zoals de oceaan kan het leven kalm en mooi zijn maar evenzeer heftig en stormachtig. De oceaan neemt en geeft leven. Na een korte neoklassieke opener met meeuwengekrijs als toemaatje, pakt Sweet William meteen met het titelnummer uit, “Ocean” dat meer aansluit bij het oude begin jaren 90 werk van de band, lees; meer richting krachtige gothic rock. Volgens de persbio zou dit nieuwe album dan ook dichter aansluiten bij het oude materiaal en dat is zeker ten dele waar. De muziek van Sweet William blijft evenwel eclectisch klinken en laat zowel indie rock, psychedelica, tot elektronische arrangementen en pop toe in het totaalgeluid. Niet voor één label te vangen dus, de muziek blijft even grillig en onvoorspelbaar als de albumtitel hoewel het totaalpakket meer aansluiting vindt bij gothic rock / dark wave dan het comeback album “Brighter THan The Sun”. Nummers als “Ocean”, Insane”, “Welcome To The Show”, het dromerige “Last Restart”, “Over” of “Ground” zijn nummers met potentieel. Ook de cover van de Joy Division klassieker “New Dawn Fades” werd met veel sinecure en respect voor het origineel in elkaar gezet. Met “Ocean” bewijst Sweet William terug van weg te zijn geweest en weten ze hun jarenlange ervaring te verpakken in een matuur, sfeervol album dat een extra dimensie geeft aan de vertrouwede gothic rock sound. Soms poppy, dan weer psychedlelisch en af en toe een stevige goth rocker maken “Ocean” niet alleen veelzijdig maar een aangename luistertrip voor al diegene die zich niet door een zwart gat (lees genre etiket) laten vangen. Almost thirty years’ experience behind them and yet Sweet William doesn’t cease to surprise us with its music. Once again, the Germans go far beyond the scene’s clichés and stereotypes with the release of “Ocean”. Another highlight is their awesome cover version of Joy Division‘s classic “New Dawn Fades”. Yet deeply respectful with the original song’s passion, Sweet William has turned the screw even further in its interpretation. Desde el pasado 31 de marzo esta disponible este magnifico disco que pase por alto y que recientemente descubro no sin jubilo ante tal maravilloso descubrimiento. 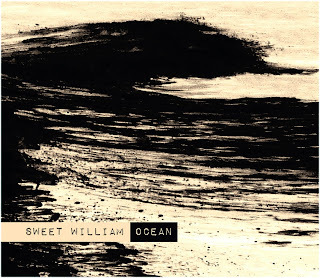 Se trata de Sweet William a lo largo de los 18 temas que componen este trabajo conceptual por titulo Ocean no sumergimos de lleno en sonidos en un sensacional sonido de rock con una excelente voz que parece envolverte con cambios de ritmos belleza en su musica con un sonido muy minimalista y toques electronicos que se fusionan a la perfección. Ahora podreis escuchar su disco integro ademas el disco encierra en su interior una versión de Joy Division el temazo New Dawn Faces en el 5 corte, sin mas dale al Play. 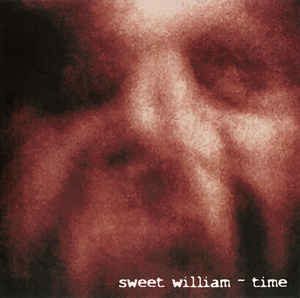 ot long ago I reviewed Sweet William's recent 'Time' album and someone from the band's team informed me that they sent a couple previous albums to Chain D.L.K. for review, but they apparently never got reviewed (things sometimes slip through the cracks) so they sent me copies of 'Ocean' (2013) and 'Organic Shades' (2016) which I'm grateful for because these albums deserve some attention. In my review of 'Time' I spent some time briefly describing some of the history of this seminal German Goth band, but no point in regurgitating that again. While 'Time' covers a lot of ground, moods and form, 'Ocean' is predominantly stark old-school Goth. This is an album that sounds as if it could have been made in the early '90s. It's basic, visceral, and intense. 'Ocean' is supposed to be a concept album but unlike many of those that seem to have songs in them merely to further the concept, the songs here all stand on their own. At first I wasn't wild about 'Ocean' because it didn't seem as polished or refined as 'Time' but after repeated listening, I find it just as good, if not better. There is a rawness about 'Ocean' that really cuts to the bone. Even the instrumental track "Tsunami" has a certain harshness and alienation about it that is just chilling. There is much that is similar in flavor to '80s-'90s wave/goth bands we all know and love- The Cure, Echo & the Bunnymen, Clan of Xymox, Siouxsie & the Banshees, Bauhaus, Joy Division and numerous others on this album. For nostalgia's sake (and likely because it's a great song too) there's a cover of Joy Division's "New Dawn Fades" which in my opinion is even better than JD's original version, being much more powerful, although I'm likely to take some heat for that from Curtis's rabid fans. Although there are a few throwaways (kind of natural on an album of 18 tracks) on the album the majority of the tracks are very good, with some such as "Ocean," "Insane," "New Dawn Fades," "Welcome to the Show," and "over" being quite compelling. Oliver Heuer and bandmates Frank Breuer, Markus Gerlach, and Marius Nagel are all in top form on this recording. 'Ocean' is a moody-broody album, but then again, aren't all the best Goth albums? Sweet William zag het levenslicht in 1986 en is op heden nog altijd actief, zo verscheen in 2010 op het Franse D-Monic “Brighter Than The Sun” en op een ander Fans label, Infrastition, is nu een heruitgave van het conceptalbum “Kind Of Strangest Dream” dat oorspronkelijk in 1992 bij Hyperium verscheen, gelimiteerd heruitgebracht. De groep begon ooit als een gothic rock band maar liet later, en dat is al hoorbaar op deze cd, een veel bombastischer en psychedelischer geluid na dan op de vorige werken. Een huzarenstukje waarop Led Zeppelin en Fields Of The Nephilim een paringsdans aangaan. Wat je krijgt is dan mossel noch vis, maar anderzijds is deze “Kind Of Strangest Dream” best een aantrekkelijk luisterstuk, zeker als uw voorkeur de hallucinante jaren ’70 rock en gothic rock wegdraagt. En al zullen ze niet bij bosjes rondhuppelen deze liefhebbers, ze bestaan, geloof me. U krijgt op deze fraai verpakte heruitgave 2 bonusnummers en het nooit eerder uitgebrachte “Free Just Free” wat het totaal op 12 nummers brengt in plaats van de originele 9. Ik geef toe dat ik me persoonlijk beter kon vinden in het pure gothic rock geluid uit de eerste levensjaren van het Duitse Sweet William, maar de groep was en is niet te beroerd om te evolueren, op “Kind Of Strangest Dream” gaan de donkere gitaren en strakke ritmes het duel aan met psychedelisch gitaar plukken en geestesverruimende verhaallijnen. Sweet William is quite a familiar name for all gothic and new-wave lovers. Infrastition has picked up this artist to celebrate the 20th anniversary of the album “Kind Of Strangest Dream”. This CD was originally released in 1992 on the great German label Hyperium Records. This reissue is a kind of gift for all fans and those who didn’t buy the original version and an ode to Oliver Heuer (aka Sweet William). The album hasn’t really lost its original splendor and part of reverie. Sweet William moves in between softer and ballad-like inspired songs on one side and harder songs on the other side. The guitar playing was one of the main characteristics of the release. Sweet William sometimes walks throughout endless guitar passages and solo parts. “A Creation Of My Thoughts” is one of the most noticeable cuts in the genre. I also like the half-spoken vocal parts on this song. Another remarkable cut in the genre is “An Offer (That Can’t Be Refused)” although I’ve to say this song also features psychedelic passages. But I first of all remember this album for its softer and more ballad-inspired songs. One of the most noticeable tracks in the genre remains “Sweet Smile Glow”. I also want to mention the darker and poetry-like “A Thursday Morning (A Short Story Of My Mind)”. The reissue of the CD also features 2 bonus songs. That’s a nice gift and attention for the fans, but to be honest with you not the most significant songs of the album. I think it would be a good idea to re-release some other Hyperium releases as well. Hier kann man sich ergötzen an Kratzgitarren, schillernden Leadgitarren, tief pumpenden, hier und da in klassische Achtelfiguren verfallenden Bassgitarrenläufen, schön hölzern klingenden Snares – und über allem schwebt die melancholische, zumeist in den tieferen Lagen agierende Leadstimme. Eine berührende, fesselnde Stimme, die oft in weite, psychedelisch anmutende Hallräume gesetzt wird. Man könnte das Gesamtbild womöglich als melancholisch stimmenden Post-Rock bezeichnen, der sich zwar der guten alten Zerrtongitarren bedient, vor allem aber ruhig und souverän in sich schwingt. Zwischendurch ertönen Pianoklänge, geheimnisvoll säuselnde Keyboardflächen durchziehen den Hintergrund, kleine Ausflüge in den Funk und sogar ein wenig in den Prog-Rock erlauben sich die Musiker gar. Eine Platte, um mit ihr den Sommer zu verbringen: Traurig und doch verheißungsvoll, mit Momenten überschwänglicher Emotionalität, die eine eigene kleine Magie hervorzurufen vermag. Wenn man sich hierauf einlassen kann – ein bisschen mehr Biss würde dem Gesamtbild womöglich nicht unbedingt schaden. Erstaunlicher Nebeneffekt: Die insgesamt einnehmende Leadstimme von Oliver Heuer beinhaltet Nuancen von Jim Morrison, und manchmal erinnert sie an Dave Gahan. After a long hiatus and some line up changes the band strikes back in 2010 with abrand new and delightful album entitled 'Brighter than the sun' where their show once again their ability to create strong songs with wonderful melodies. Their psychedelic gothic sound is now enriched with electronic sounds, the result is absolutely incredible! 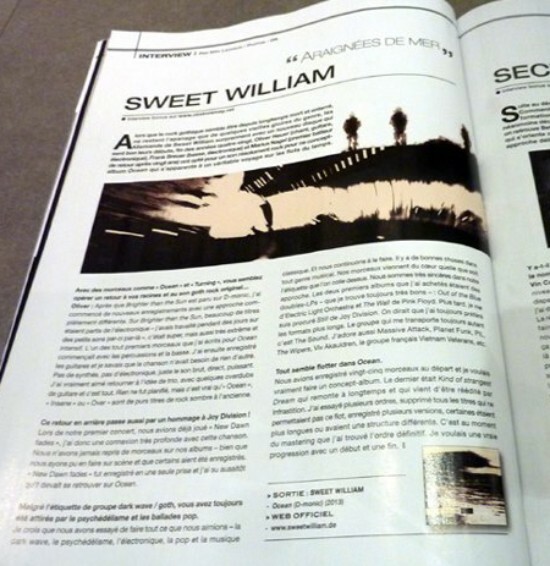 Sweet William is one of the newest signings on the French D-Monic. Hailing from Germany we can consider Sweet William as a 'big fish'. They can look back on an impressive discography, releasing albums on labels like Hyperium, Dion Fortune, Dianthus Barbathus and more recently on Datakill. Sweet William sounds like a mature band moving on in their very own style. New wave has always been a source of inspiration for them, but I've always liked the way they transpose their influences into a personal writing. It sounds now refreshing (cf. "Lonely Bedroom") and than moody (cf. "Creature"). Later on it moves into a quite energetic way (cf. "Timeless") to finally come into a groovy-wave style (cf. "Transsize" and "Alright"). Sweet William even comes to a kind of funky-wave style (cf. "Backflow"). The originality is definitely a trademark from this band, but being original and that creative the same time is not that evident to find. "Brighter Than The Sun" brings all these elements together on one single release! Guitars and electronics have been remarkably joined together while the vocals, which aren't the main aspect are however finalizing the composition. Sweet William tent to prove that new wave is still alive and in constant motion! Ein recht unkonventionelles Album hat es heute in die Besprechung geschafft. „brighter than the sun“ heißt das gute Stück und ist der neueste Wurf der Elektro-Rocker SWEET WILLIAM. Auf 14 Titeln toben sich die Herren mit einer Mischung aus Psychedelic und Prog sowie Elektro gehörig aus. Häufig findet man sich als Hörer da dann auch mal in den harmonischen Sphären des frühen Trance wieder. 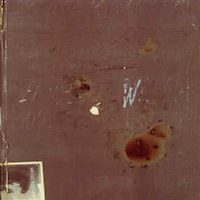 Manche Melodien, die da hervorgezaubert werden – z.B. im Titel „backflow“, wo sich die Percussion-Lines wunderbar mit Gesang und Basslines verschmelzen – sind echt klasse, Respekt. Active since the mid eighties, Sweet William during the years released albums for labels such as Big Noise Rec., Dion Fortune, Hyperium, Datakill, etc. Their latest album has been recently released by D-Monic, French label which is a subdivision of M-Tronic. The fourteen tracks of BRIGHTER THAN THE SUN mix goth rock melodies, electronic arrangements and new wave melancholy. Passing from the mid tempos of the opening "Be around" arriving to the psychedelic dark ballad "Nowhere rd." Sweet William pass through the electronic wave of "Lonely bedroom" (maybe the song I preferred) and the pulsating goth electronic of "So long". Using different approaches for every song the band sound is characterized by a sort of melancholic energy thanks to the warm voice of Oliver Heuer and to the electronic rock wave atmospheres created by Frank Breuer and Markus Gerlach. Dopo lunghi anni di silenzio tornano finalmente a pubblicare un nuovo album per la D-Monic gli Sweet William, progetto portato avanti con insistenza e caparbietà fin dal lontano 1986 per opera del leader (e unico membro superstite della formazione iniziale) Oliver Heuer. Negli anni trascorsi il loro curriculum si è arricchito di numerosi album pubblicati per quattro diverse etichette (fra cui Hyperium e Dion Fortune), prestigiosi tour (uno dei quali culminato al Marquee di Londra) e un quattordicesimo posto nella classifica tedesca di musica alternativa. Ad oggi il gruppo di Colonia si presenta come un trio dove la leadership indiscussa rimane nelle mani di Oliver, che, coadiuvato dal bassista Frank Breuer e dal batterista Markus Gerlach, si divide tra vocals, chitarre e synth. Anche la direzione musicale, com'è giusto che sia dopo tutti questi anni, si è evoluta, virando da classiche sonorità goth-rock verso una sorta di raffinato e singolare electropop. Le contaminazioni presenti sono tra le più variegate: ci si può imbattere nella new wave dell'iniziale "Be Around", per poi abbracciare il suono più caldo, quasi blueseggiante di "Creature", caratterizzata da un languido mood e da un soporifero riff di slide guitar. La cosa affascinante sta nel fatto che a queste sonorità viene associata la freddezza di drum machine e beat elettronici minimali, ricordando a tratti le atmosfere della colonna sonora di "They Live" di John Carpenter e Alan Howarth, o l'eterogeneo album "Phoenix" degli Xymox. Restando sulla parte ritmica, è curioso notare come, in un contrasto di opposti, certi brani elettronici presentino una batteria reale ("Lonely Bedroom"), mentre altri quasi totalmente acustici siano supportati da batterie elettroniche. Lungo i 68 minuti dei 14 brani presenti su "Brigher Than The Sun" ci si può quindi imbattere nella psichedelia swing di "Backflow", nei sincopati ritmi post-rock di "Shimmer" e "So Long" e nel new romantic alla Simple Minds di "Never Leave". "Reflection" può apparire invece come un improbabile incontro tra i Third And The Mortal di "Memoirs" ed i francesi Noir Desir. C'è anche spazio per l'electropop di "Transsize" e l'ambient di "Outro". Insomma, ogni canzone è diversa dalla precedente. Non è mai facile entrare pienamente nell'ottica di proposte così variegate, che sembrano denunciare una mancanza di personalità, un'irrisolutezza interiore o, nel peggiore dei casi, una subdola e megalomane voglia di essere amati da tutti. In questo caso, però, un filo conduttore c'è, e si sente: innanzitutto la sensuale voce di Oliver, a metà strada tra Bono Vox, Wayne Hussey e Adrian Borland; poi quella dolce ricercatezza di semplici e pacate armonie che sono state per anni il punto di forza di gruppi come Sad Lovers And Giants, The Chameleons e Kitchens Of Distinction, anche se in questo caso traslate in un contesto più variegato. Un punto debole lo si può comunque scovare: i brani di "Brighter Than The Sun" appaiono troppo spesso come il frutto di sessioni di improvvisazione, rimanendo intrappolati in quella struttura; alle volte si sente la mancanza di veri e propri ritornelli da poter canticchiare, come nella maggior parte delle proposte di chiara matrice pop. Tuttavia, "Brighter..." rimane comunque un buon lavoro. Un album nostalgico, coraggioso e particolare, che mescola sapientemente le atmosfere degli anni 80 con elementi pescati dai generi più disparati, denso di personalità e capace di creare una propria atmosfera dall'inizio alla fine. Al di là dei gusti personali, non ci si può esimere dal fare un plauso a Oliver e ai suoi Sweet William. Dass SW wieder da sind, habt ihr ja sicher schon dem Artikel in diesem Heft entnommen. In der Zeit, wo man nahezu nichts von der Band gehört hat, sind sogar einige absolut hörenswerte Veröffentlichungen erschienen, von denen sich vor allem die beiden oben genannten Alben lohnen. Wer noch die alten SW Sachen kennt, wird die Formation kaum wiedererkennen, denn der Sound hat sich schon stark verändert, ist aber nicht minder gut. Auf "Welcome Tomorrow" und "World" sind einige Einflüsse von Depeche Mode zu erkennen, allerdings ist der Sound wesentlich gitarrenlastiger. Samples und Drumloops, die eher vom Trip Hop insperiert scheinen, verleihen der Musik einen sehr rhythmischen, modernen Charakter. SW sind eindeutig im 21. Jahrhundert angekommen und klingen modern und frisch wie nie. Der auf unserer Compilation enthaltene Song "Skin" (vom WORLD Album) erinnert mich wiederum etwas an The Mission, allerdings ohne den üblichen Hussey-Schmalz Pathos. Durchaus ein Stück, was auch im Radio laufen könnte. Wenn`s nach mir geht, steht SW die Zukunft offen. In diesem Sinne "Welcome Tomorrow"
So wirkt auch "Full Of Light" vom neuen SW Album souverän, relaxt und entspannt. Anläßlich eines Konzerts im Würzburger Zauberberg Teil einer ausgedehnten Tour wurde ich Zeuge des Phänomens SW. Zeuge einer pychedelischen Jagd über Schlagzeug, Bass und Gitarren, einer Jagd nach den richtigen Sound zum rechten Augenblick. SW ist ein lautloses Ereignis außerhalb der Bühne, auf der Bühne aber tobt dieses Ereignis in unglaublicher Hingabe an seine Musik. SW haben absolute Perfektion erreicht. SW hatten den Sound einer Superband, vergleichbar mit den großen alten Psychedelikern wie etwa Hawkwind. Electro Rock mit eingängigen Melodien vom Feinsten. new album "The Early Days"